Autumn is coming, and for many of us living in older properties this means the arrival of all sorts of extra bodies for the winter months. House spiders are creeping into corners, queen wasps will soon be curling into the creases of curtains, and best of all, the cold early mornings might turn up a fish or two. 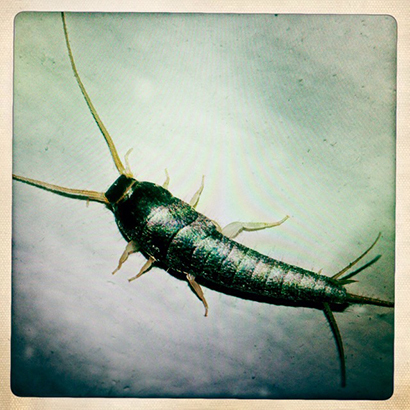 Yes, Fishpool is well aware that the silverfish (Lepisma saccharina) is an insect – not a fish, but if any six-legged crawler deserves the accolade of a Bits n’ Pieces appearance then it is this little chap. Silverfish are among the oldest insects in the world, dating back 400 million years. They are wingless and their abdomens have a series of ‘scales’ that, along with the rest of the body, turn a grey-silver after the third moult, when the animal is mature. Though regarded as a pest for their fondness of nibbling old books, silverfish aren’t all bad. They clean up after us for one thing, eating dandruff and hair, along with the bodies of other dead insects. They are nocturnal and often only seen on dark mornings when they scarper as the light-switch is flicked. Fishpool thinks they are pretty cool. They can go a year without food and occasionally make it into their teenage years. And they look awesome. What’s not to like?